Did you know that violations of fall protection regulations can result in personnel and company fines in the range of thousands of dollars? Or that injuries or deaths resulting from fall protection violations can result in legal action and cost companies tens of thousands of dollars? Recently one such story was published by CBC Saskatchewan http://www.cbc.ca/news/canada/saskatchewan/safety-violation-saskatchewan-employer-occupational-health-1.4030827 Thankfully, more companies than not are now taking fall protection very seriously in Saskatchewan, and Northern Strands is here to help! Additional fall protection questions Northern Strands Fall Protection is regularly asked, "What are my responsibilities as an employer? What kind of fall protection plan do I need and how to I implement it?" These are all very good questions that we are more than happy to answer. However the answers can potentially vary depending on the situation. In most cases our Fall Protection Team will need to visit the site to perform an assessment and provide a recommendation or quote. 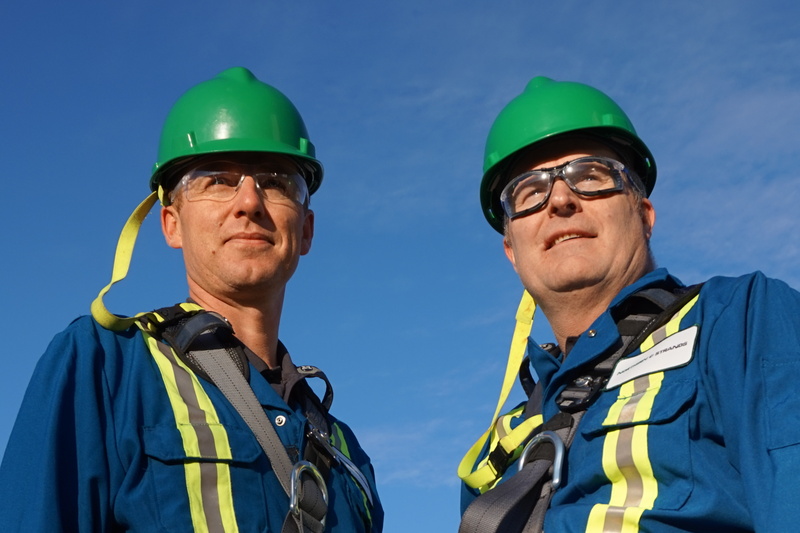 Contact the Northern Strands Fall Protection Division today to find out more about OH&S fall protection regulations in Saskatchewan by requesting an assessment. We specialize in the design and installation of roof fall protection systems. (i)	is maintained according to the manufacturer’s recommendation. (1.1) Unless otherwise specifically provided, an employer, contractor or owner shall ensure that there is a lifeline that meets the requirements of this section for every worker. (c)	eight millimetres if the lifeline is made of wire rope. (b) installed and used in accordance with the design mentioned in clause (a) or the manufacturer’s recommendations. 67/2007 s7; 21 Sep 2007 SR 91/2007 s3. 102(1) An employer or contractor shall ensure that a personal fall arrest system and connecting linkage required by these regulations are approved and maintained. •	is fastened to a lifeline or to a secure anchor point that has a breaking strength of at least 22.2 kilonewtons. 10 Aug 2007 SR 67/2007 s8. (9)	the connecting linkage is attached to a personal fall arrest system, lifeline or secure anchor point to prevent the worker from falling more than 1.2 metres. (k)	Where a snap hook is used as an integral component of a personal fall arrest system, connecting linkage, full-body harness or lifeline, an employer or contractor shall ensure that the snap hook is self-locking and is approved and maintained. •	is approved and maintained. 4 Oct 96 cO-1.1 Reg 1 s105. Workers’ responsibilities re lifelines, etc. (12)	is protected from heat, flame or abrasive or corrosive materials during use. (b)	the lifeline is protected at the lower end to ensure that the line cannot be fouled by any equipment. (b)	subject to subsection 274(5), is attached by means of a connecting linkage to a fixed anchor or a lifeline. (4)	A worker who uses a full-body harness and connecting linkage shall ensure that the connecting linkage is attached to a personal fall arrest system, lifeline or a fixed anchor. Inspection of full body harness, etc. (b)	as soon as is reasonably practicable, the defect is repaired or the unsafe condition is corrected. 10 Aug 2007 SR 67/2007 s10. includes a device that is designed to protect a worker against hypothermia. (o)	ensure that a net is installed that is capable of safely catching the worker if the worker falls. (c)	a sufficient number of properly equipped and trained workers to implement rescue procedures. (15)	An employer or contractor shall ensure that a life jacket or personal flotation device is provided for each worker who is transported by boat or works from a boat, and that each worker uses the life jacket or personal flotation device at all times when the worker is in the boat. 4 Oct 96 cO-1.1 Reg 1 s108. 115 In this Part, “toeboard” means a low vertical guard that is located at the outer edge of a platform, scaffold, floor, stair or walkway and that is designed to prevent materials or equipment from falling over the edge. 4 Oct 96 cO-1.1 Reg 1 s115. (g)	“travel restraint system” means a system that prevents a worker from travelling to the edge of a structure or to a work position from which the worker could fall. (b)	there is a possibility of injury if a worker falls less than three metres. (3)	An employer or contractor shall ensure that a worker at a permanent work area is protected from falling by a guardrail or similar barrier if the worker may fall a vertical distance of more than 1.2 metres and less than three metres. (4)	Notwithstanding subsection (3), where the use of a guardrail or similar barrier is not reasonably practicable, an employer or contractor shall ensure that a worker uses a travel restraint system. (5)	Notwithstanding subsection (4), where the use of a travel restraint system is not reasonably practicable, an employer or contractor shall ensure that a safety net or control zone or other equally effective means that protects the worker from falling is used. (4)	activities within the normal course of business on a permanent loading dock that is not greater than 1.2 metres in height. 10 Aug 2007 SR 67/2007 s11. (i)	workers are not protected by a guardrail or similar barrier. (d)	the rescue procedures to be used if a worker falls, is suspended by a personal fall arrest system or safety net and needs to be rescued. (8)	The employer or contractor shall ensure that a copy of the fall protection plan is readily available before work begins at a worksite where a risk of falling exists. (9)	The employer or contractor shall ensure that a worker is trained in the fall protection plan and the safe use of the fall protection system before allowing the worker to work in an area where a fall protection system must be used. (b)	is not less than two metres wide when measured from the unguarded edge. (b)	shall follow the most direct route to get to or from the unguarded edge. (5)	An employer or contractor shall ensure that a control zone is clearly marked with an effective raised warning line or other equally effective method if a worker is working more than two metres from an unguarded edge. (b)	a means that is as equally effective as a travel restraint system and that prevents the worker from getting to the unguarded edge. 116.3(1) Where a worker uses a personal fall arrest system or a travel restraint system, an employer, contractor or owner shall ensure that an anchor point or anchor plate that meets the requirements of this section is used as part of that system. •	the time specified by the manufacturer. •	is permanently marked as being for travel restraint only. (l)	In the case of a personal fall arrest system installed on or after one year after the date this section comes into force, an employer, contractor, owner or supplier shall ensure that anchor points to which the personal fall arrest system is attached have an ultimate load capacity of at least 22.2 kilonewtons (5000 pounds-force) per worker attached in any direction in which the load may be applied. (12)	support structures for safety nets. (n)	Where an elevated conveyor crosses over a place where a worker may pass or work, an employer, contractor or owner shall ensure that suitable precautions are taken to prevent materials on the conveyor from falling on the worker. 4 Oct 96 cO-1.1 Reg 1 s117. •	have a mesh size that is not greater than 40 millimetres by 40 millimetres. 4 Oct 96 cO-1.1 Reg 1 s118. 119(1) Subject to section 120, where a worker is required to work in an area where the worker may be in danger from a falling object, an employer, contractor or owner shall ensure that the worker is adequately protected by the installation of an overhead barrier. (2) An employer, contractor or owner shall ensure that every area where a worker could be struck by a falling object is clearly marked by barriers, notices, warning lights or other warning devices. 4 Oct 96 cO-1.1 Reg 1 s119. Protection from objects falling from scaffolds, etc. 120(1) Where a suspended scaffold, suspended powered scaffold or load-carrying unit is suspended from or attached to a structure, an employer, contractor or owner shall ensure that wire mesh, or other material equally effective to prevent objects from falling from the working surface, is installed from the working surface to a height of at least 900 millimetres on all sides except the side adjacent to the structure. (8)	a hoist cage in an excavated shaft. effective means for the protection of workers against falling materials. (p)	Where it is necessary for workers to pass through a safeguard required by this section, an employer, contractor or owner shall install a gate that is equally effective to prevent objects from falling from the working surface and shall ensure that the gate is kept closed except when the gate is in use. 4 Oct 96 cO-1.1 Reg 1 s120. (b) on an open side, is equipped with both a handrail and an intermediate rail or equivalent safeguard. (5)	Where a handrail is required for a temporary stairway to which subsection (1) applies, an employer, contractor or owner shall ensure that the handrail is constructed of at least 38 by 89 millimetre construction grade lumber, or material of equivalent strength, and is supported by posts that are not more than three metres apart. 4 Oct 96 cO-1.1 Reg 1 s121. materials that are of equal or greater strength. (r)	is not less than 900 millimetres nor more than one metre above the working surface. (16)	A horizontal intermediate member is not required in the case of a temporary guardrail that is manufactured with a substantial barrier completely filling the area enclosed by the horizontal top member, a horizontal bottom member and the vertical members. (17)	A wire rope guardrail may be used at the external perimeter of a building under construction. (d)	the guardrail is arranged so that a worker coming into contact with the ropes cannot fall through the ropes. (19)	An employer, contractor or owner shall ensure that no worker hangs equipment on a guardrail. 4 Oct 96 cO-1.1 Reg 1 s122. (13)	a pit for a flywheel or pulley. (6)	Subsection (1) does not apply to a loading or unloading area if the employer, contractor or owner has taken other precautions to ensure that materials will not fall from the floor or other horizontal surface. (b)	100 millimetres from the floor or surface, in the case of a toeboard that was installed before March 13, 1986. 4 Oct 96 cO-1.1 Reg 1 s123. Openings in floors, roofs, etc. (t)	provided with a guardrail and a toeboard. (2) Where the covering or guardrail and toeboard mentioned in subsection (1) or any part of the guardrail or toeboard is removed for any reason, an employer, contractor or owner shall immediately provide an effective alternative means of protection. 4 Oct 96 cO-1.1 Reg 1 s124. 125(1) An employer, contractor or owner shall ensure that a work platform that is an integral part of a slip form used in a building shaft is designed by a professional engineer to withstand the maximum foreseeable load and is constructed, erected and used in accordance with that design. (20)	An employer, contractor or owner shall ensure that a platform mentioned in subsection (1) that has been moved is examined by a competent person and that a written report of the examination is made by the person who carried it out and kept by the employer, contractor or owner. (21)	An employer, contractor or owner shall not require or permit a worker to work on a platform mentioned in subsection (1) that has been moved before the platform has been examined in accordance with subsection (2), unless the worker is using a personal fall arrest system, a full-body harness, a lanyard or a lifeline that meets the requirements of Part VII. (22)	Where there is no work platform installed at the level of a doorway or opening in a building shaft, an employer, contractor or owner shall ensure that the doorway or opening is covered by a solid barrier that extends from the bottom of the doorway or opening to a height of at least two metres and is capable of preventing a worker or loose material from falling down the shaft. (23)	An employer, contractor or owner shall ensure that at least one warning sign indicating the presence of an open building shaft is placed on a barrier erected pursuant to subsection (4). (y)	is installed and maintained so that, at the maximum deflection of the net when arresting the fall of a worker, no portion of the net contacts another surface. 127(1) Where a worker is regularly required to walk or work on top of a storage tank, an employer, contractor or owner shall ensure that the storage tank is fitted with a permanent walkway with guardrails. (2) Where a worker is required to walk or work on top of a storage tank, an employer, contractor or owner shall ensure that any opening in the tank into which a worker may fall is guarded by a grid or other suitable means to prevent the worker from falling into the tank. 4 Oct 96 cO-1.1 Reg 1 s127."